Round Table: "Name of the Game"
At what game could Drs. Burke and Yang destroy George and Calli? one of these days. Conversely, Burke and Yang owned two apartments between them at one point. You can bet your top hat they flipped that investment for a tidy profit, one worth far more than a thimble of cash. iheartizzie: In the spirit of March Madness, I'd say basketball. 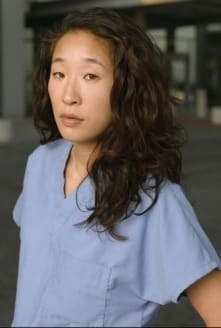 Dr. Burke would run circles around George and drain perimeter jumpers at will, and we know Cristina is not above playing dirty. She'd bring the flopping, jersey-tugging, trash-talking intangibles that would neutralize Calli's low-post advantage. This game of 2-on-2 would be a rout. And a riot. Is it wrong for Izzie to help Meredith believe she can actually knit? iheartizzie: In theory, yes. But given the sad state of Meredith's love life and her tumultuous family situation, you can't blame Izz for trying to boost her confidence. Or just shut her up. McCritic: Gosh no. The last thing we need is for Meredith to fail at making this sweater. She has enough to whine about every week. 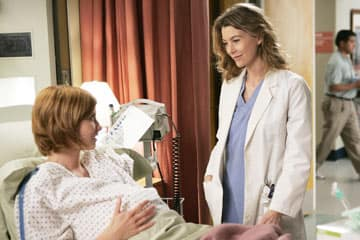 How long will Meredith's vow of celibacy last? McCritic: However long it takes the vet in her life to put on his Robin costume. She's a sucker for a man in a uniform ... or scrubs ... or standing upright. iheartizzie: Until she's good and ready. After all, this is not a young woman who makes rash, inappropriate decisions. She sticks to her guns and does what's right! Have we seen the last of Thatcher Grey and family? iheartizzie: Probably not. With Molly's husband overseas, Thatcher and his wife are doing what they can to take care of their pregnant daughter. After the procedure to repair the baby's lungs, Addison will probably want Molly to remain in the hospital for more tests, or at least for observation. It stands to reason that Thatcher would visit her at least one more time. McCritic: No way. You could tell by the pained expression in his eyes that Thatcher regretted falling out of touch with his first daughter. 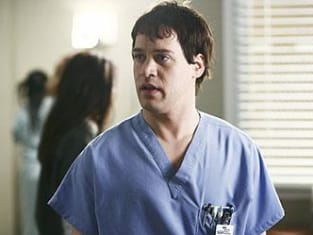 I thought I saw something in the crook of his lower left lip that made it apparent he'd be back in Meredith's life. Also, when George asked if he wanted Meredith to know he asked about her, Thatcher said yes. [narrating] "So go ahead. Argue with the ref, change the rules. Cheat a little, take a break and tend to your wounds. But play. Play. Play hard, play fast... play loose and free. Play as if there were no tomorrow. It's not whether you win or lose, it's how you play the game... right? [narrating] "A good basketball game can have us all on the edge of our seats. Games are all about the glory, pain and the play-by-play. Then there are the more solitary games. The ones we play all by ourselves. The social games, the mind games. We use them to pass the time to make life more interesting... to distract us from what's really going on. There are those of us who love to play games, any games. And there are those of us who love to play a little too much."